Where Can I Sell My Jewellery & Craft Creations? I bet you have often asked yourself that question! You've got a stash of beautiful creations, just waiting to go home with someone! Well I decided to jot a few of my ideas down for you as a guide, to get the ball rolling. For crafters who want to take their craft to a new entrepreneurial level, this book is the perfect guide. 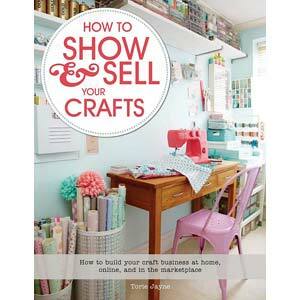 Using highly-visual, step-by-step tutorials, How to Show & Sell Your Crafts is packed with helpful branding, selling, and merchandising tips that no serious crafter should be without. Using the workspaces, shops, salons, and "through-the-keyhole" profiles of some of the world's most successful crafters, readers will learn the best ways to merchandise and sell their items online, at craft fairs, markets, pop-up events, exhibitions, and in shops. Plus, you'll learn how to build a personality-driven brand, create a memorable blog or website, improve your photography skills, and analyze your results to help move your business forward into the future. You start by learning how to optimize your workspace to improve creativity and profitability, then how to build a strong brand name and online presence across multiple social media platforms. With today's hectic lifestyle there never seems to be enough hours in the day. Thank goodness for online shopping - its never been so easy. Its an ideal marketplace to sell your creations as it provides you with worldwide exposure, and is not difficult to get started! The following sites have been provided as a guide only. Zibbet is a global marketplace, connecting buyers & sellers of Handmade Goods, Fine Arts, Vintage Items & Crafts. Quite a few of my customers sell on Etsy & with great success. Definitely worthwhile taking a peak at. Markets Online is a great site not only providing you with the facilities to sell online, but also presents you detailed information about the local markets in your area. Craft Markets Online is another great opportunity to sell your products either online or at their Market Place Stalls. It's worth taking a look at Handmade Catalog - a site for selling handmade crafts online. My Own Creation is based in the UK and is a great place for crafters to list & sell their quality handmade items. If selling online just isn't your thing, we have listed some Market Stalls that may be of interest. Why not checkout your local Gift Shop, Museum, Corner Store or perhaps a Cafe. Contact your local Tourist Bureau and get a list of the popular tourist destinations within your area. Stop by and see if they are willing to exhibit your creations on consignment. It's a great time of the year as people are heading off on holidays, so your jewellery designs & crafts are sure to receive a great amount of exposure.